Union Public Service Commission UPSC Recruitment 2018-19 (Ministry of Health and Family Welfare, Government Jobs in India) notification for 23 specialist, officer and various posts. All legible and interested candidates can apply on or before (01-02-2018). 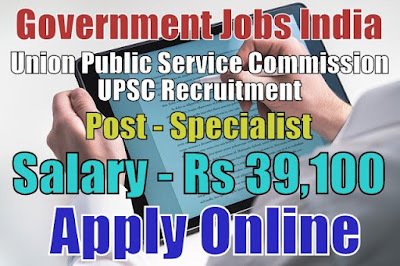 Further information about the Union Public Service Commission recruitment posts, online registration and exams, vacancies, UPSC jobs list and salary details, careers, application fee, online form, educational qualifications, UPSC government jobs, experience and all other details/information about this post is mentioned in details below. The total number of vacancies are 23. 5. Medical Officer - 11. Salary/Pay and Grade Pay - For specialist, director and medical officer posts, the payable salary will be Rs 15,600 - 39,100 with Rs 6,600 grade pay and for chemist and scientist posts, the payable salary will be Rs 56,100 - 1,77,500 per month. Further information about salary details is mentioned in the detailed advertisement. Age Limit - For UPSC recruitment, a candidate age should be less than 43 years. To know more about age details, click on the detailed advertisement. Last Date for Submitting Application Form - All candidates must apply on or before (01-02-2018). After the last date, no application form will be submitted.